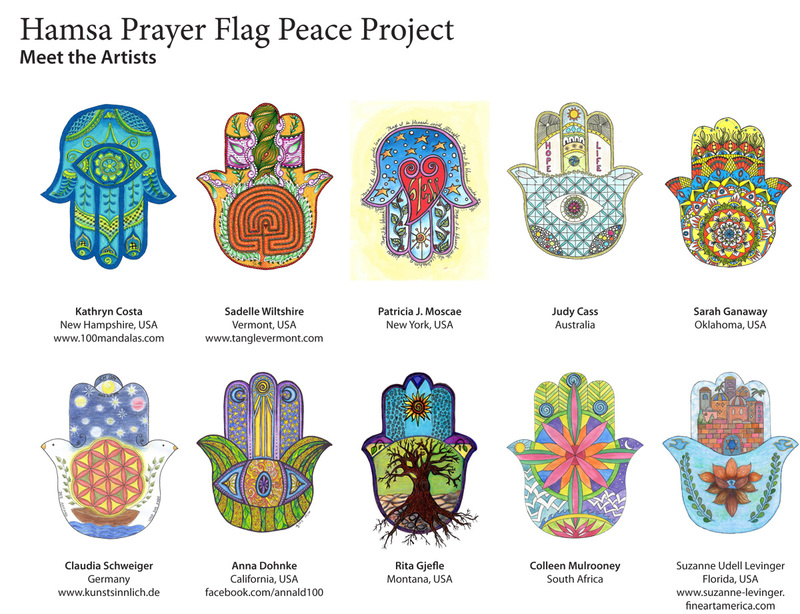 Ten hamsa images designed by members of the 100 Mandalas Community were selected for this special prayer flag project. Each of these flags were colored by the artist and while they were working on them infused them with the intentions of goodwill and peace. May all who hang and enjoy these prayer flags receive our blessings. The hamsa is a familiar symbol of the open palm that traditionally represents protection when the fingers are pointing upward and as a symbol of blessings when the palm is open and the fingers are pointing downward. Since the symbol of the hand is shared among many faiths including Jewish, Muslim, and Christians, the hamsa has become a symbol of peace in the Middle East. 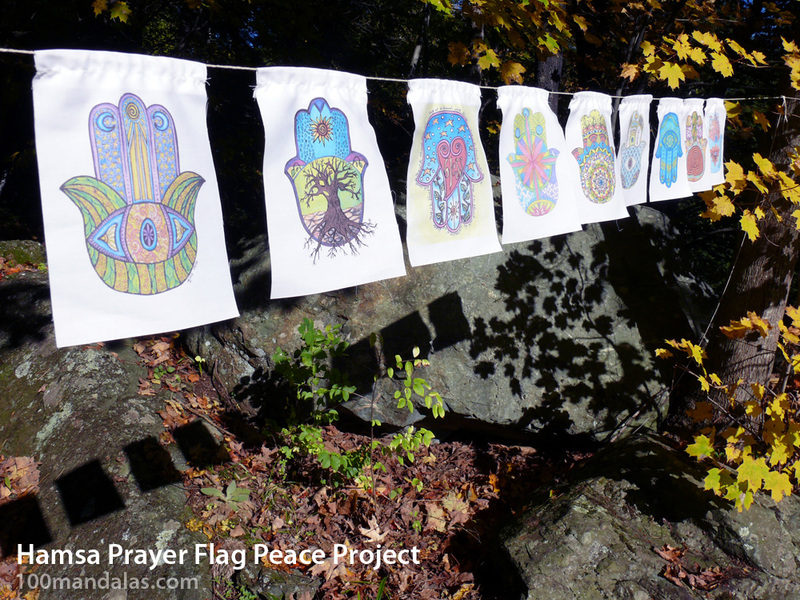 Click on the image above for a closer look at all of the prayer flags in this project and the artists who created them. At the time of publishing this project, there has been an estimated 220,000 people killed and 11 million people forced from their homes as a result of the conflicts in Iraq, Syria, and Afghanistan. When I saw the photos and read the stories by Brandon Stanton of “Humans of New York,” this crisis now has a face for me. I was talking with a colleague of mine and we were both feeling deeply saddened and moved by these stories. 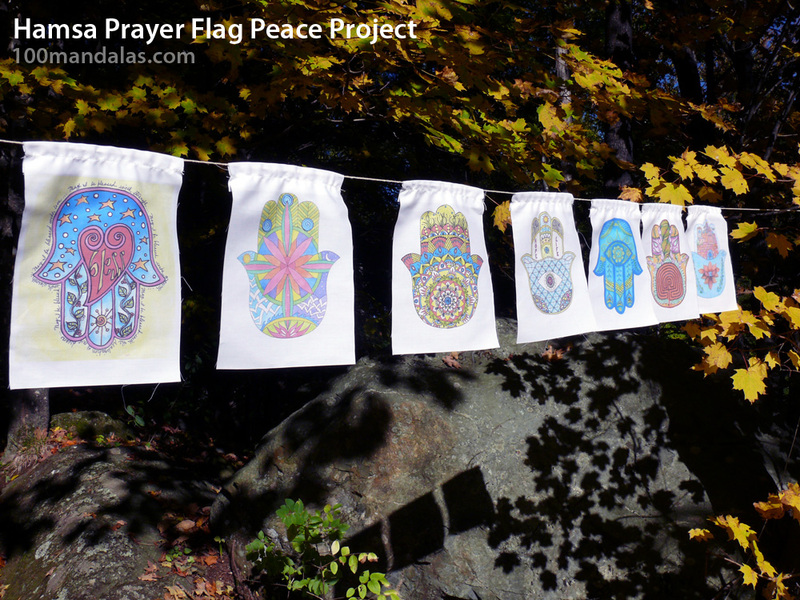 Then it dawned on me that I was working on this hamsa project that included beautiful prayer flags infused with the desire to spread peace. In that moment I knew that I had to offer a portion of each sale of these prayer flags to an organization that is responding to the crisis. I selected Catholic Relief Services, an accredited non-profit, that is working to provide shelter, food, water, medical care, education, and care for the children to the millions of displaced families from Syria, Iraq, and Gaza. Learn more about this crisis by visiting www.crs.org. 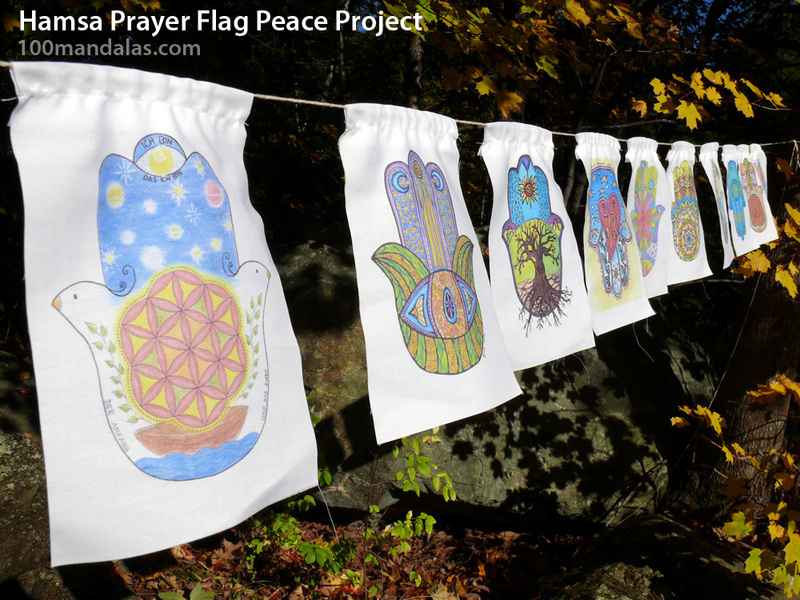 50% (of the total purchase price) of each prayer flag sale will be donated to Catholic Relief Services.